KAHULUI - When the last car horn had sounded Sunday night and all the kupuna had gone home, what did the weekend-long demonstration for Native Hawaiian rights at Kahului Airport actually accomplish? "I think this is opening a lot of eyes," said Roland Kanuha, 75, who left his Naopuu home near Kaupo at 3:30 a.m. three days in a row so he could stand up against the latest effort to end traditional access and other entitlements for Hawaiians. "I think it showed not only people on Maui what this is all about, but people on other islands and visitors, too." Organizers of the nonviolent protest couldn't have been happier with the turnout and results of the event that began tenuously Friday morning. Patty Nishiyama of Na Kupuna O Maui, the group that obtained the permit to hold the demonstration, said more than 2,200 had waved signs over the first two days and she figured about 1,500 more were on hand over the course of Sunday. "It's been awesome," said Nishiyama, who had to raise her voice to be heard over the din of honking vehicles. "The tourists are leaving here knowing what this is all about and what we are facing. We even had tourists signing petitions for us." The demonstration was prompted by lawsuits filed last year by Hawaii residents John Carroll and Patrick Barrett that call for ending government programs and traditional access rights guaranteed to Native Hawaiians by the state constitution. Hawaiian homesteaders from other islands, planning a statewide protest on an undisclosed date, had hoped that Maui Hawaiians would hold off on the rally, but leaders here were tired of waiting. The two dozen kupuna who were the spiritual leaders of the event couldn't have been prouder of their island from their curbside seats. "You would think that Oahu would have been first, but I guess this shows that Maui really is no ka oi," said Helen Nakanelua, 88, of Wailua. "You have to be brave to be the first, and Maui was brave to do this." Nakanelua was one of several in her family to take part in the weekend's event, including her great-granddaughter, Veronica Luukia Nakane-lua, who's not quite 10. "She was excited," said Nakanelua. "She said, 'Grandma, I was one of the protesters today.' "
While some officials feared trouble that could lead to altercations and frighten unsuspecting tourists, the demonstration actually seemed to unify rather than tear apart. Diana Hughes blasted the horn on her rental-car pickup van each time she cruised by the airport terminal with her customers on board. She said the reaction by visitors was simply curiosity, not fear. 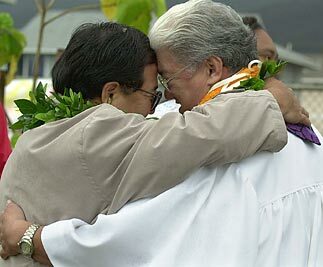 "I tell them this is about supporting Hawaiians and saving our land," said Hughes. "When they hear about what's happening, they agree with us. They tell me they wouldn't be coming to Hawaii if there weren't Hawaiians. They come here for the Hawaiian culture and our lifestyle, so they're concerned about this (lawsuit), too." Kili Namau'u, director of Punana Leo O Maui, admitted it was "a little scary" when she arrived Friday morning because no one knew if emotions between determined protesters and airport officials would boil over. "But it's truly an 'Act of Aloha,' " she said, citing the official name of the event. "Nobody's fractionalized. Everyone is together: the kupuna, the keiki, the makua (parents), the opio (youngsters). There's Hawaiians, there's non-Hawaiians. We're getting the information out to the visitors and the Hawaiians - there's a lot at stake here." The sidewalks leading to the airport were filled with as diverse a crowd as one could find, with sign wavers of all ages and ethnic backgrounds. James T. Tanaka, 84, sat in the front row with the Hawaiian elders, even though he's an American of Japanese ancestry. "My heart is Hawaiian," said Tanaka of Makawao, whose father was taken in by Hawaiians years ago in Pelekunu Valley on Molokai. "I want to help the Hawaiians get reorganized and bring them together. I want to help them get what they lost." Mayor James "Kimo" Apana stopped by twice, once bearing armloads of doughnuts for the early morning participants. Entertainers such as kumu hula and recording artist Keali'i Reichel joined politicians - including state Sen. J. Kalani English, former state Rep. Sol P. Kaho'ohalahala and Maui County Council Member Alan Arakawa - on the sign-holding lines. Members of different sovereignty groups, often at odds over the political future of Hawaiians, held signs carrying the same message. Nishiyama said she was told that even groups in Tahiti and Tonga held their own rallies to show support for their indigenous brothers and sisters on Maui. Mahealani Poepoe, holding hands and singing with other kupuna, thought the swell of solidarity best summarized the event. "It means a new era for the unity of the people," said Poepoe. "The people will not be divided or isolated. They will walk in the light of their dignity and their pride." For all the enthusiasm and satisfaction fueled by the success of the event, community leader Dana Naone Hall hoped supporters would not put their signs into mothballs. She called the weekend demonstration "a good first step" but emphasized that efforts must continue to educate everyone about what could happen if the Hawaiian provisions in the state constitution are overturned. "These lawsuits are not about justice," said Hall. "Are we as a society going to extinguish the ability of Native Hawaiians to practice traditional gathering and access rights that are essential to the life of the culture? Will our society be more just if thousands of Native Hawaiians on Native Hawaiian homesteads are forced out of their homes? Are we prepared to pay the moral, social and economic costs of these actions? "This rally is just the beginning of looking at those consequences."